we were up bright and early this morning, but the bus ride to yamanishi prefecture was not quite as long as expected, so we stopped for lunch. we walked through a sweet little market where the locals were selling pickled bamboo, pickled plums, yuzu-cha, homemade noodles, and something yamanshi is known for: grapes. they're expensive in japan (a small bunch can cost 1000 yen or more -- roughly $9.) we found them here for 700 yen. they're huge, and juicy, and NOT seedless. 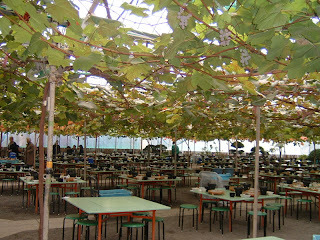 we headed out the back of the market to an open air restaurant under the vines of a vinyard. there, at tables with a small grills underneath and foil covered cooking areas in the center, we barbecued our own pork and beef and onions and sprouts. it was incredibly charming, and delicious.